Our survey department is an active member of CESAM - Comité d'études et de services des assureurs maritimes et transports and is therefore recommended in their global network. • Ullage for liquid shipments and draft survey for bulk shipments. • Loss assessment & survey of vessels' hull & machinery for pre-insurance. 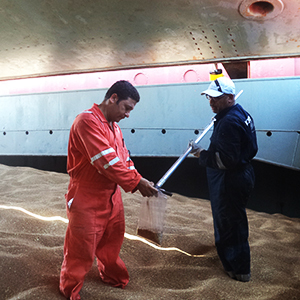 • Pre-loading inspection of vessels holds to determine their fitness. • Control of handling for prevention of losses and institute reserve measures for all types of goods especially heavy lift and projects equipment. • Resources at court against ship owners and/or road transporters, through our specialized legal department. • On & Off-Hire inspection for condition and bunker. Our survey activities are extended to neighboring countries in Africa & other Arabian countries upon request. Additional special services could be extended in response to our clients' demand - to deal with quality inspection of goods such as foodstuffs and engineering equipment, controlling and surveying the loading/discharging operations of crude oil tankers.